Thousands of people have taken to the streets of Baghdad after Friday prayers, to protest against what they see as a foreign occupation of their country. 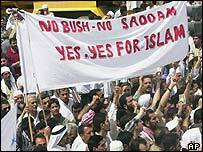 The marchers carried flags and banners saying "No to occupation" and demanding that the unity of Iraq be preserved. The BBC's Christian Fraser in Baghdad says it is the biggest demonstration of Arab nationalism since the end of the war, and shows what powerful sentiments the US-led invasion of Iraq has stirred up. It came as foreign ministers from Egypt and the countries neighbouring Iraq held talks in the Saudi Arabian capital, Riyadh, to discuss how to influence the post-war situation in the region. The foreign ministers of Saudi Arabia and Egypt said before the meeting began that the US should withdraw its forces quickly and allow Iraqis to choose their own government. The BBC's Heba Saleh in Cairo says that - although the countries represented at the meeting have had uneasy relations in the past - they are united by their fear that chaos in Iraq could bring more instability to the region. The protesters were led by a respected and well-known Sunni Muslim scholar, Ahmed al-Kubaisi. He is reported to have used his sermon to denounce the American-led invasion, whose purpose, he said, was to defend Israel. Our correspondent says there was a tense confrontation earlier when an American patrol stumbled into a crowd kneeling outside a mosque. He says the worshippers surged forward angrily, but the US commander skilfully withdrew his troops and defused the situation. The troops had entered the area of the mosque to distribute humanitarian aid. It was the first full Friday prayers since Baghdad fell to US-led forces last week. The talks in Riyadh - the first such meeting since the start of the war - are to address the reconstruction of Iraq and the issue of how to deal with a future US-led administration in Baghdad. Egypt and Iran have already said they would not recognise such a government. 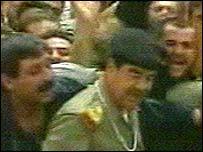 Officials say the ministers may decide to issue a public declaration of support for Syria, which the US has accused of harbouring fugitive members of Saddam Hussein's regime and of developing chemical weapons. Our correspondent says the Riyadh meeting will give Iraq's wary neighbours - Saudi Arabia, Kuwait, Jordan, Syria, Iran, and Turkey, plus Egypt and Bahrain - the chance to assess each other's intentions. She says many in the Middle East fear the US has now occupied Iraq and will manipulate any future government there. As decisions are made about who will run Iraq in the interim, US President George W Bush has urged the UN to lift its economic sanctions against Iraq, freeing up sales of its oil. But diplomats who for many years have called for an end to the sanctions, which were imposed in 1990 following Iraq's invasion of Kuwait, are now calling for a delay. They say the restrictions should remain until the UN certifies that Iraq is free of weapons of mass destruction. 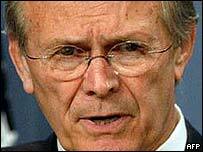 US Defence Secretary Donald Rumsfeld has said he does not believe they will be found unless Iraqis knowledgeable about the arms programmes reveal their whereabouts. "It is not like a treasure hunt where you just run around looking everywhere, hoping you find something. "I think what will happen is we'll discover people who will tell us where to go find it," he said. "The protest...was peaceful but wouldn't have been permitted under Saddam Hussein"
"Had it not been for the Americans Saddam would still be here"